One of my classmates her first job after college was to create names for movies. Name is very important in affecting people perception. 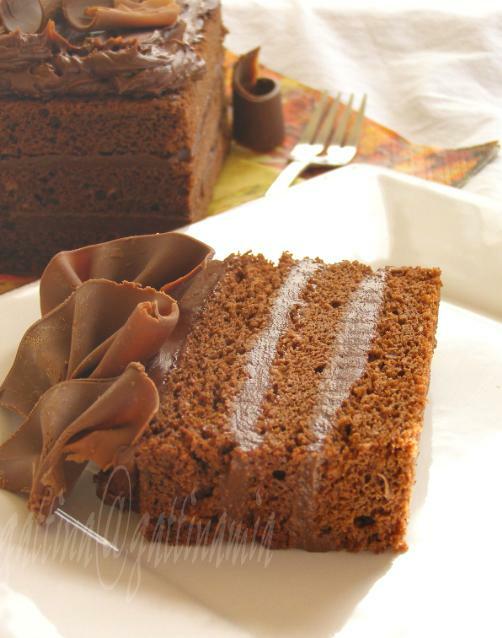 For naming a cake, I think devil's food cake is one of the best. This catchy name no double can easily wow everyone including those even haven't had this cake. 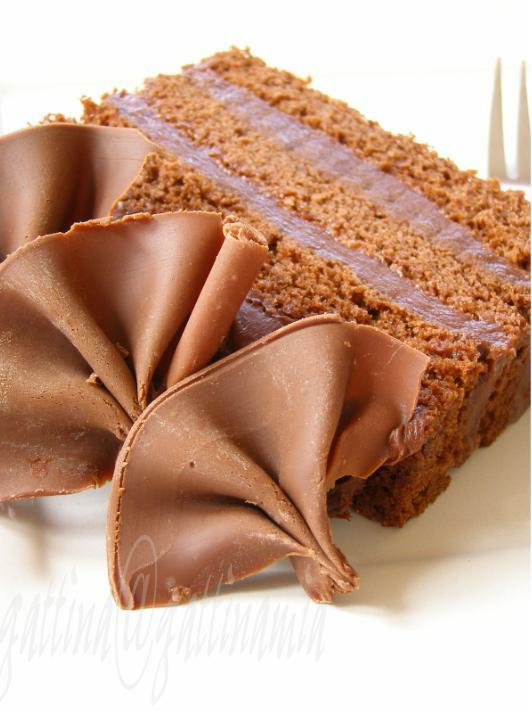 It is a lovely cake afterall, and so easy to accomplish; I really enjoy taste one, or even better, bake one! When a cake's recipe (like Peabody's) requires to add warm water in batter, you'll expect an extraordinarily tender cake... probably due to the heat breaking up the gluten (?). But if you use cake flour or farina 00 instead of plain/ all-purpose flour, I think you should avoid heating up the water, pershaps someone can verify it for me? I've made three alternations from Peabody's recipe... First I used rectangle pan instead of round; second I used Panengeli lievito pane degli angeli to replace the baking powder and baking soda, not surely if it caused the less dark color; third, the cake's layers were filled with manufacturer's chocolate pudding, just to add a variety in the texture. The top was spread with fudge chocolate frosting, decorated with chocolate "fans" made from chocolate. Last but not least, please go see how deeply dark Peabody's cake is, no matter you are devil or not still can't resist this wonderful cake! It is a sin, not to eat that cake !!! Lovely Lovely !!! Dear Gatina! what can I say? this cake is GORGEOUSSSS! Teh pictures are fantastic! Compliments and thank you for thinking of me! Your devil's food cake is absolutely gorgeous and brings one of those instances where I don't feel weird licking my monitor. heee! Wow Gattina, marvellous! Another gorgeous cake! And what a name for a cake indeed! 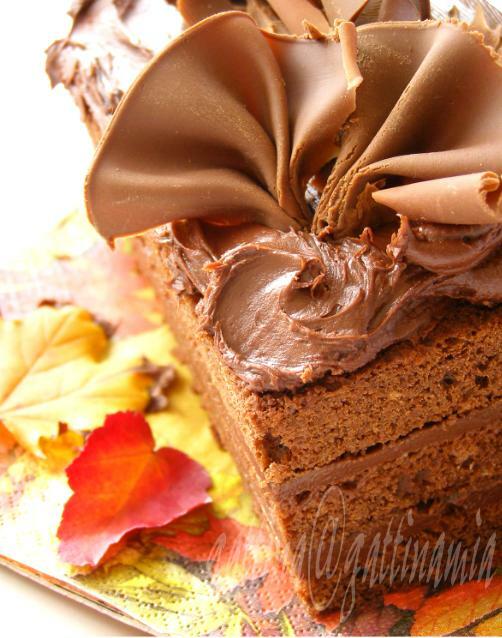 Beautiful devilish cake and love chocolate fan there! Very approciate for Halloween without the scares , with only lot of love!! what a yummilicious looking cake!!!!! !the choco fans are really beautiful.i am going to make this soon. I am a sucker for anything chocolate and gosh! yours really tempt me. gorgeous!! :) I love anything that's chocolatey!! Wow !! Wow ! !What a fantastic looking cake. Definitely going to try this. I love your chocolate fans! WOw...this cake is simply Wowwwww. 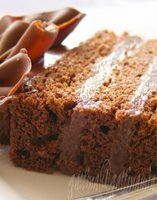 How do you make the chocolate fans ? I totally agree about how a name can affect one's perception (from movies to cakes). And deeply dark devil's food cake is a great name for a great cake. Nice job! Gattina, this cake looks lovely! Beautiful presentations for such a delicious recipe! A rich beautiful cake, Gattina. I love how you decorate it with chocolate fans. Did you made them yourself? If so, how do you made them?